Or the driver will be expected to drive the train and be responsible for passenger safety. Southern Rail plans to abolish guards on trains and introduce Driver Only Operated trains on nearly all their services through Surrey and Sussex. 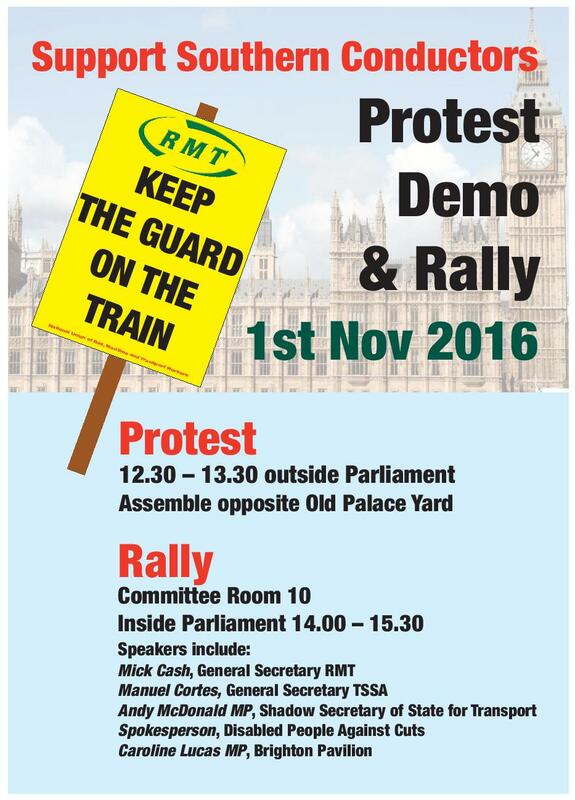 If they get their way up to 400 guards could lose their jobs – and many of us will find train travel that bit more uncomfortable, alarming, or impossible. Driver Only Operation means the driver will be the only guaranteed member of staff on the train. The driver will be expected to drive the train and be responsible for passenger safety. Those of us who have had to deal with drunks, groping men, or witness racism or hate crime, and those of us in wheelchairs or generally needing assistance even on good days will appreciate that this is not possible. And even when it’s a not-at-station stop, the guard has an important role responding to people’s concerns. Guards are fully trained in operational safety and route knowledge, including being able to secure the doors safely, protecting the train and acting in emergencies such as derailments or fires. If there is an accident or even a terrorist attack, the guard can call for assistance and inform and reassure passengers. Independent inquiries after train crashes and fatalities have consistently said that we need on-board staff trained in protection and evacuation procedure. One of the survivors of the Paddington rail crash in October 1999 has pledged her full support for the Rail, Maritime and Transport (RMT) union’s campaign to defend the role of the guard on Southern Rail. As the anniversary of the Paddington train crash passed yesterday – I wanted to write and offer my voice in support of your dispute with Southern. As a survivor of the crash in which 31 died and countless others were burnt and injured, I am only too aware of the role of the guard/conductor. Colin, our guard helped many people and in my eyes was a hero, directing many survivors to safety. What did the drivers do you may ask? Sadly, they were both immediately killed, which for me underlines the deep importance of guards in the event of a serious incident. We must not forget either that the incident was caused by lazy management and lack of communication. 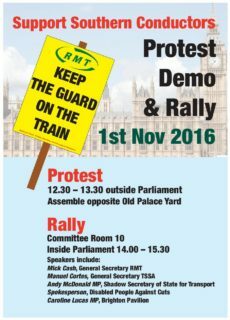 Responding to this, Mick Cash, RMTs General Secretary, said: “We are grateful to Helen Mitchell for contacting the union and pledging her support for our campaign on Southern Rail. “Her personal story illustrates just what a crucial role the guards fulfil on our railways, a role that goes way beyond the spin from Southern Rail about the opening and closing of doors. “The guard was crucial at Paddington 17 years ago just as the guard was crucial in the landslip and derailment incident at Watford [in September]. “These are facts that cannot and should not be ignored by rail companies like Southern who are seeking to put private profit before public safety. Please write to your MP and make celar to them how many people need guards on trains and why. And join the protest on 1 Novvember 2016 outside the House of Parliament from 12.30-1.30pm.